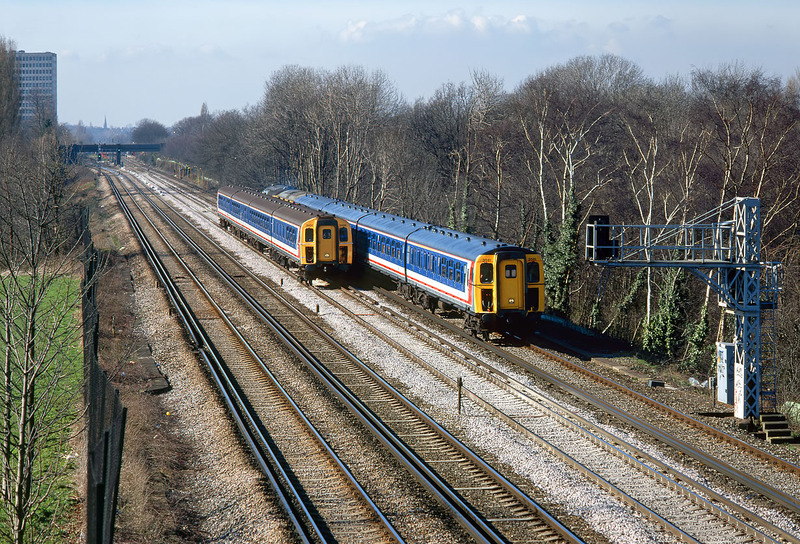 Class 423 4-VEPs 3581 & 3434 run side by side past New Malden on 4 March 1995. However, this is not quite the everyday Southern suburban scene that it appears to be, as a closer inspection reveals something a little different on the rear of 3581. This is in fact the D-Tours 'Tatty Cat' railtour, with 73105 & 33117 at the rear. 3434 is working the 10:35 Basingstoke to Waterloo service. Ordinarily this would be a very fortunate parallel running picture, but in this case 3434 has got in the way slightly!